Euonymus is a genus of flowering plants in the staff vine family, Celastraceae. A family of which consists of over 130 species including both deciduous and evergreen shrubs and small trees. For those unfamiliar with Euonymus hedging plants, you may recognise its English name, Spindle. Its secondary name originated from its historical use as the wood from some species was traditionally used for the making of spindles for spinning wool. Over time, their cultivation has seen this species appear frequently across the UK for the countless benefits they provide for our gardens and their unique appearance makes them popular in garden designs and throughout the show garden community. Their popularity stems from their ornamental foliage and their ability to establish a formal, structured look as they are utilised for garden borders to showcase pathways, create focal points and to highlight other garden features such as larger hedges or sculptures. When left to grow, their bushy habit allows them to create an informal look which therefore gives you the opportunity to create a more relaxed atmosphere than those trimmed to shape. 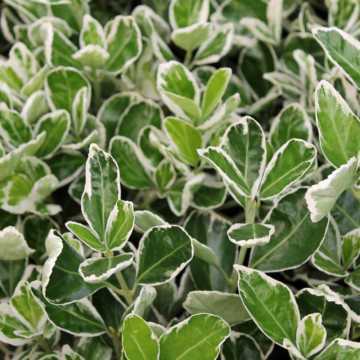 Here at Hedges Direct, we have a fantastic selection of the best Euonymus hedging plants for you. Access the brightly coloured, variegated foliage that offer unique shades and patterns of green, whites, yellows and pinks. As our Euonymus plants are evergreen, their fantastic foliage is present year round so you have constant cover and exciting interest year round. 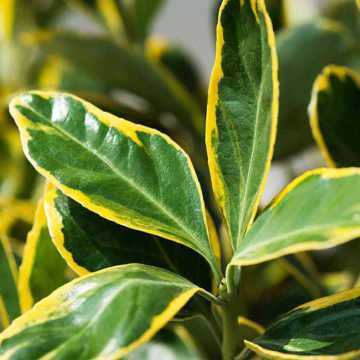 Euonymus fortune Emerald n Gold makes your garden look fit for the Queen with its bright green leaves edged in gold; the perfect garden jewel. Its colourful interest doesnt stop there as it welcomes winter as the foliage transforms into soft shades of pink and red. 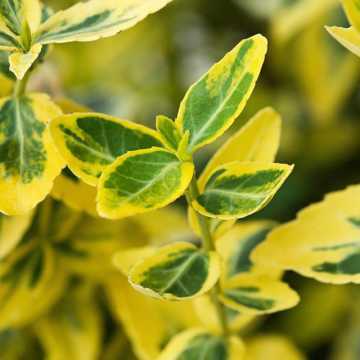 For similar looking foliage, Euonymus japonicas Ovatus Aureus plants offer variegated leaves, this time displaying dark green leaves with bright yellow outlines. In addition to its delightful foliage, summer green flowers appear in spring, occasionally followed by pink fruits. 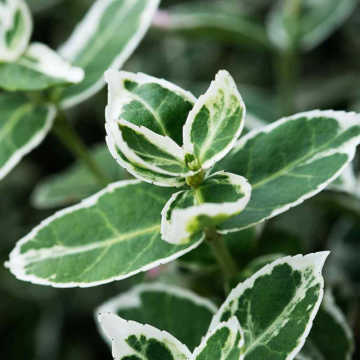 For alternative foliage colour, consider the white tinted patterns of Euonymus fortunei Emerald Gaiety' and Euonymus japonicus Kathy. Both species exhibit polished, dark green leaves with a unique outline of white/silver. However, Euonymus fortune Emerald Gaiety produces small, oval leaves and a more compact structure, compared to the large leaves of Euonymus japonicus Kathy which creates a brilliant effect as they move simultaneously with a strong breeze. Euonymus japonicus Jean Hugues displays lush, dark green, glossy foliage of a very compact nature. 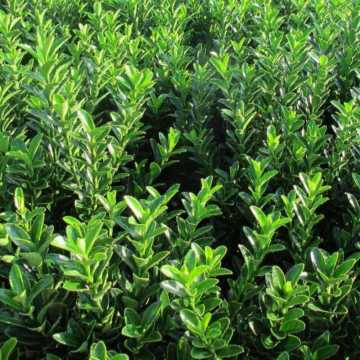 Hence why it is a popular alternative to Box (Buxus sempervirens) as it resembles the practicality of Box hedge plants, without the worry, Box blight  see more options in our Box alternatives and blight section. Our Euonymus shrubs are fit for every garden as they will thrive in all types of growing conditions. These plants will thrive in moist-normal soils in shaded areas, but for their colour to fully flourish, they prefer positions exposed to full sun. For seaside gardeners, we know that youre faced with extreme weather conditions but dont worry, you can achieve all of your gardening goals, no matter your location when choosing Euonymus. These plants are a tough species which have an impressive success rate in all kinds of locations and coastal environments pose no threat to these hardy plants. With an average annual growth rate of 10-20cm, ideal for hedge heights of up to a metre, the variety of Euonymus hedging plants we supply are the perfect low maintenance, low growing shrubs. They simply require a quick prune in late spring in order for bushy growth to develop. They will thrive in exposed coastal and inland weather conditions, they favour no specific soil type and will grow in positions revealed to full sun and partially shaded areas.